Single Blade Lockback Pocket Knife 3 3/16"
This pocket knife is made in Texas. The blade locks back for safety and the liner is brass. The blade measures 2 3/8 inches when open. This great everyday carry knife has a Delrin handle with the Moore Maker Shield. 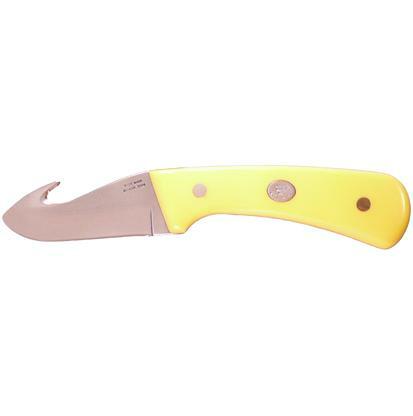 Lockback Trapper Pocket Knife 3"
This everyday carry trapper pocket knife has a blade made of 1095 HC steel that has been hardened to 57+, and is 2 3/8 inches long when open. This knife has a lock back design and a brass liner. The closed length is 3 inches and the handle in made of Delrin. Fixed Blade Gut Hook Knife 7 3/4"
The delrin scales are nearly indestructible. This fixed blade knife has a full tang 1095 HC steel that has been hardened. 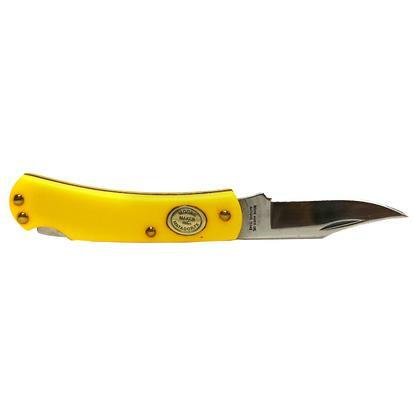 This knife is 7 ¾ inches in overall length and is ideal for the avid outdoorsman. 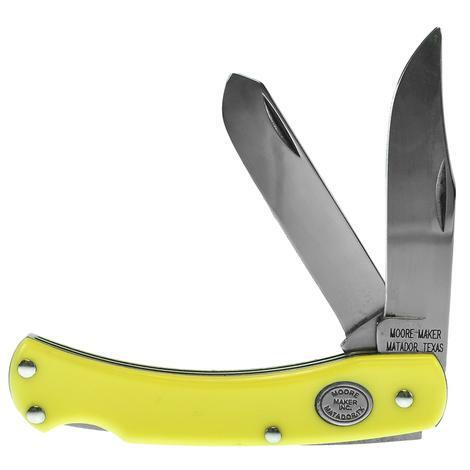 Moore Maker Single Blade Lockback Pocket Knife 3 5/8"
This everyday carry pocket knife has a lock back design. The blade is made of 1095 HC Steel Hardened to 57 +/- 1 Rockwell. The handle is made of Delrin and the knife has a length of 3 5/8 inches closed. 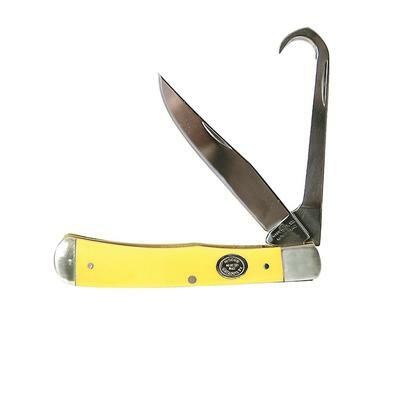 Single Blade Lockback Trapper 2 1/4"
A folding knife that can fit almost anywhere. This American made pocket knife makes a great first knife of backup carry. The knife is just shy of 2 ¼ inches closed. The blade is 1095 HC Steel Hardened to 56+/- 1 Rockwell and measures 1 5/8 inches. It has a lock back safety system and a handle made of delrin. 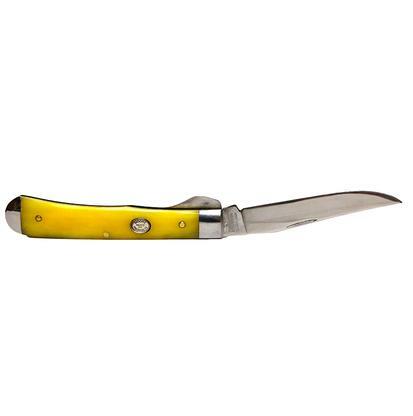 Double Blade Trapper Pocket Knife 4 1/8"
This American made knife has two blades made of high carbon steel. The handle is made of delrin. This everyday carry pocket knife is 4 1/8 inches long when closed. Manufactured in Texas. 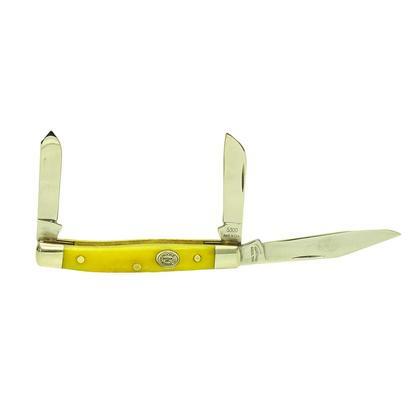 This is the ideal horseman’s pocket knife. The delrin handle is smooth in the hand. It is a folding knife with a Master blade and a hoof pick made of carbon steel that has been hardened to 56 Rockwell and highly polished. The bolsters are nickel steel and the liners are brass. At 4 1/8 inches when closed so it fits well in the pocket or in a sheath. Moore Maker Double Blade Lockback Trapper Pocket Knife 3 1/2"
This is an American made work knife that is manufactured right here in Texas. 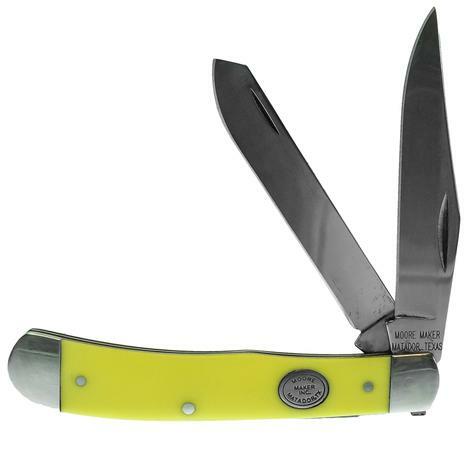 It is a double lock back trapper that makes a great everyday carry. The blades are made of hardened 1095 high carbon steel. This folding knife can fit into a pocket or a sheath. It is 3 ½ inches when closed and 6 ½ inches with the blades out. 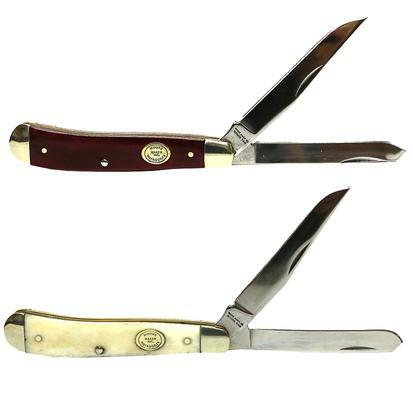 Both blades and the leather punch blade are made from 1095 high carbon steel. The steel has been hardened to 56 Rockwell. 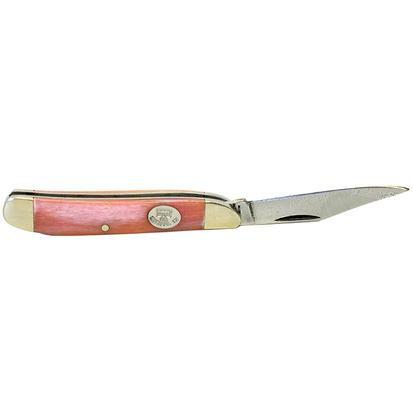 This is a Stockman pocket knife with a delrin handle. It is 3 7/8 inches when closed and is an ideal everyday carry. 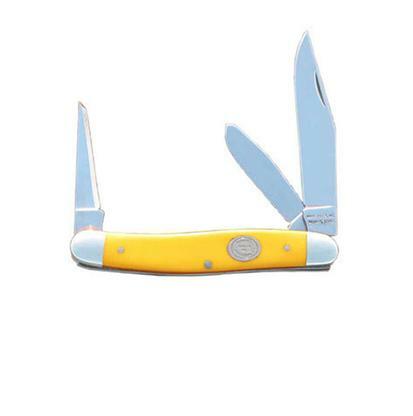 This everyday carry pocket knife has a Spey blade and a Master blade. The blades are both made of 1095 hardened high carbon steel. The hardness is 56 Rockwell. Mother of Pearl completes the handle of this EDC that is 3 inches when closed. This is a single blade pocket knife with a liner lock. 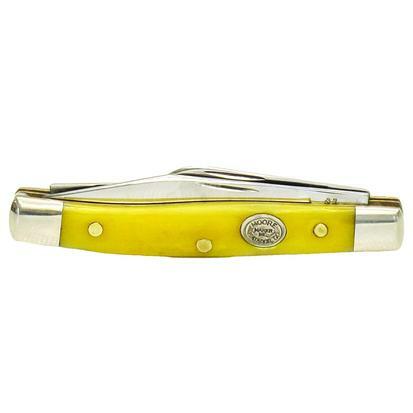 The handle is made of yellow, all natural bone. 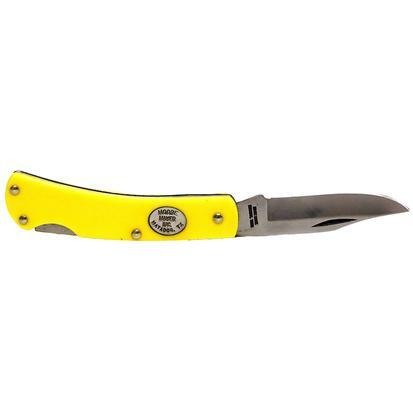 This is an everyday carry blade that can be carried in the pocket or in a sheath. It is 4 ¼ inches long when closed. This knife is made by Moore Maker in Matador, Texas. 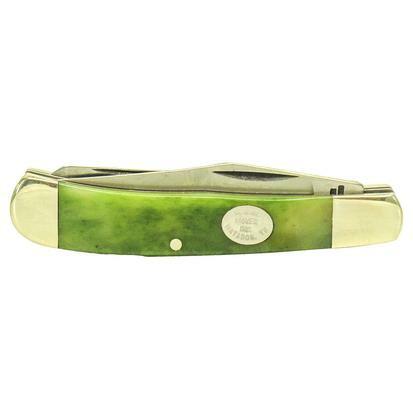 Single Blade Peanut Pocket Knife 2 3/4"
This folding knife is made with 1095 high carbon steel and bone. The steel has been hardened to 56 Rockwell and the bone is pink. Overall this pocket knife is 2 ¾ inches when closed. 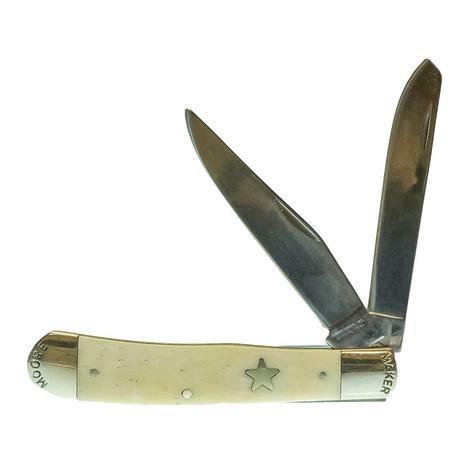 Double Bladed Bone Trapper Pocket Knife 3 7/8"
This trapper knife has a classic design and a handle made from shin bone. The bone has been smoothed. The two blades are Spey and Master. The blades are hardened HC steel. This 1095 steel has been hardened to 56 Rockwell. The pins and liners are made of brass. This is an American made folding knife that is manufactured in Texas. It can be carried every day in a pocket or a scabbard. 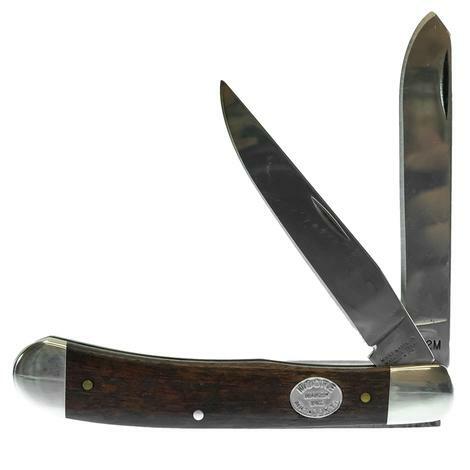 Double Blade Mesquite Trapper Pocket Knife 4 1/8"
This Trapper knife is made from Texas Mesquite that comes directly from the Moore family ranch. Each one is going to be unique because of the natural variation of this beautiful natural material. Both the Spey blade and the Master blade are 1095 high carbon steel that has been hardened to 56 Rockwell. 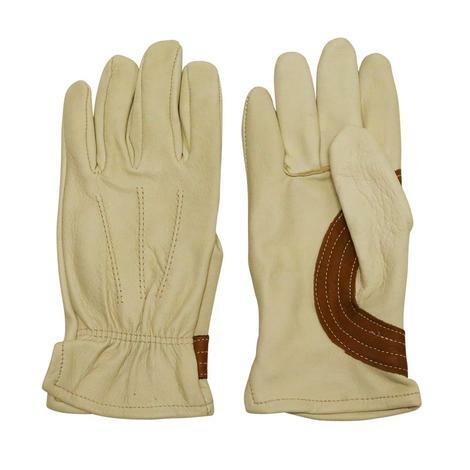 This is an American made product produced in Texas. This is a Texas made every day carry knife that is 4 1/8 inches when closed. The bone handle is smooth. There are two blades, both made of hardened high carbon steel. 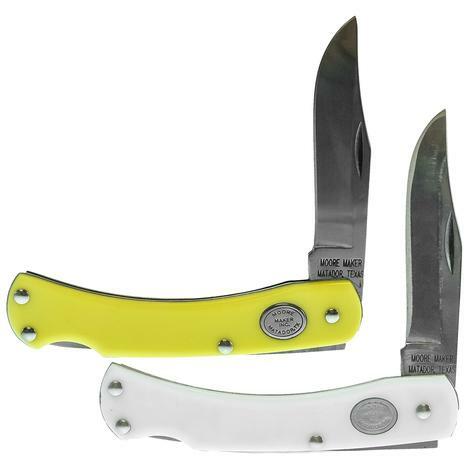 This pocket knife holds a Spey blade and a Master blade that are both hardened to 56 Rockwell. Pony jack trapper has two blades that are both hardened to 56 Rockwell. 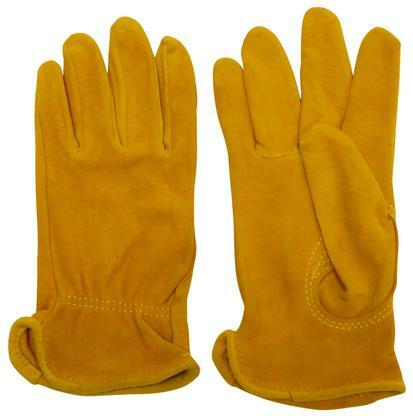 They are both made from high carbon steel. The bolsters are nickel, the liners are brass, and the handle is bone. This pocket knife is 2 ¾ inches when closed. Made in the U.S.A. 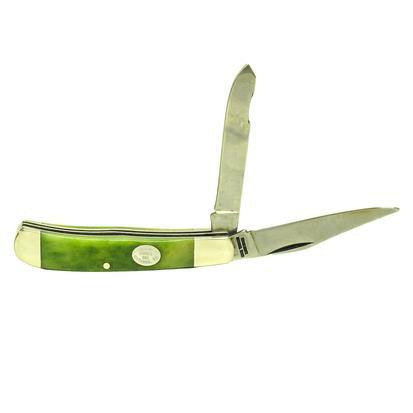 Smaller trapper with a green bone handle. 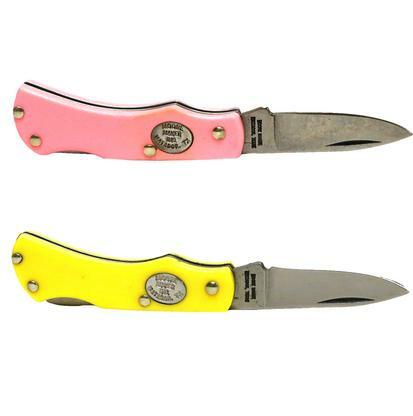 This is a double bladed pocket knife with a Spey blade and a Master blade. Both are HC steel that has been hardened to 56 Rockwell. This is an ideal everyday carry that measures 3 inches closed, but is still a trapper. 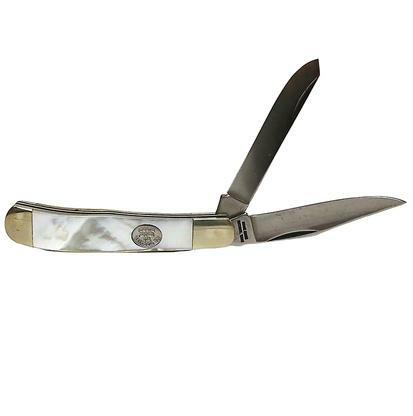 Stockman pocket knife with 3 blades that measures 3 3/8 inches closed. It has 3 blades that are all made of 1095 high carbon steel that has been hardened to 57 Rockwell. The handle is made of cow shin bone. 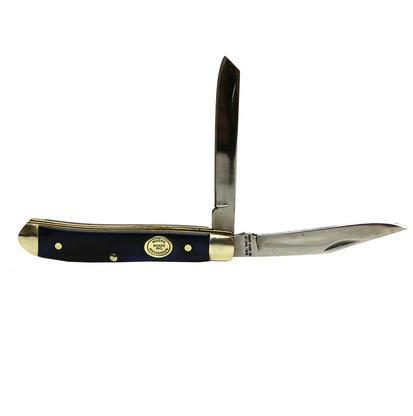 This folding knife also features brass pins and liners.